I think a lot of people hold themselves back from starting a business because they struggle with validating their business idea and finding customers. What if you didn’t have to worry about either of those things? In my last business, I generated $600,000 a year from total pool of just 50 customers. That was it! Within 3 years I secured 32 of those potential customers as clients. I helped a friend of mine, Griffin Jones, launch his digital marketing agency for fertility clinics two years ago. He only has 200 potential clients in North America. Last year he generated over $200,000 in revenue! The approach I used to build my last business and to advise Griffin, reduces the amount of time you need to validate your business idea, as well as the time you spend chasing after customers. 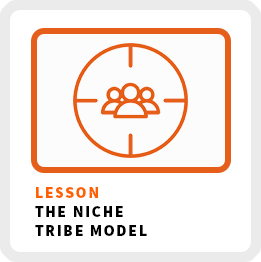 I call it “The Niche Tribe Model”. The basic idea is to become the go-to person in your area of expertise for a particular niche-market of related businesses. You want to become the “X” for “X”. I was the digital advertising sales expert for local broadcasters. Griffin has turned himself into the digital marketing expert for fertility clinics. By the way, you don’t have to be a digital marketer for this business model to work! It can be used for any type of expertise. The simplest path to working for yourself is by making money from what you already know. I’ll let you in on a little secret: the first business for most entrepreneurs wasn’t an idea that popped into their head, it was something they were already good at or already knew a lot about. When you are starting a business for the first time, there is a learning curve, so why make it even harder by trying to learn a new skill, industry or profession? You are doubling or even tripling your workload! #1 Make a list of all your marketable skills. What are hard skills that you possess that you can make money from? Basically, can you do some or part of your current job as a freelancer, a consultant or independent worker? #2 What do people ask you for help with? What do you know so much about, that people keep going to you to ask you questions about it? What are you so naturally good at that people keep asking you to either do it for them or have questions about it? Your business will be so much more successful when you find an idea that gives you confidence because you are already good at it and are motivated to do it because people already want it from you. You’ll be more passionate about your business idea and people will be attracted you because of that passion. In my case, I was naturally curious about digital marketing and kept experimenting with it. I kept sharing my results and before I knew it, I was the go-to expert for people in the industry that employed me. Once you’ve discovered your most marketable skill, find a niche that trusts you. Here’s the thing, you can no longer just call yourself a coder, a writer, a digital marketer, a baker or whatever your skill happens to be. You have to focus on a niche, so you stand out and people can easily find you. You have to be known for something. You’ll get lost in the crowd if you try to be all things to all people. Again, the goal here is to be the “X” for “X”. It’s no longer enough to refer to yourself as a “graphic designer”. You need to now refer to your profession in the context of the core group of customers you serve. You now need to be the “graphic designer for lawyers” or the “graphic designer for florists”. I spent the first 5 years of my career in broadcasting, so as I refined my digital marketing skills, it was only natural that local broadcasters would become the niche tribe I served. I was already part of their tribe and they trusted me because they saw me as one of them. #1 Make a list of all the industries and business groups where you already have a lot of connections. Try to be as specific as possible. For example, I had a potential customer base of 20,000+ radio and TV stations. It would have been too overwhelming to target them all. I decided to focus on state broadcast associations, who represented local radio and TV broadcasters in each state. I reduced my niche down to just 50 potential clients. #2 Make a list of niche business groups you are passionate about, but don’t have a lot of connections. It’s always easier to accelerate trust when you already have connections, but passion is a great alternative. If you are really into the mission of a new business niche tribe, they will accept you as one of their own. However, your interest must be genuine. Clients are no longer just buying your product or service, they are also buying your enthusiasm for their mission. When I lived in Boston, the women who cut my hair was struggling to expand her business. I asked her which of her services was most popular and then I asked her what aspect of her work she enjoyed the most. Turns out it was the same thing: color correction for women. She rebranded her salon to focus on this one aspect of hair treatment. Guess what? Within months she was getting more bookings than she had previously by just focusing on that one service. The more narrowly you focus your target, the more business you will generate. I know, it’s pretty counterintuitive! #1 Attend a conference and better yet, speak at one. It might be easier to connect with more people than ever using social media, but nothing beats in-person contact to build deeper relationships more quickly! #2 Create case studies with a handful of clients. This will demonstrate to the rest of the tribe you understand the nuances of their business and how you work with them. #3 Create a short ebook, presentation, guide, infographic or video to show you understand the challenges your target tribe is facing in your area of expertise and how you can solve those challenges. Then give that content away for free to them all! You have to give to receive. You have to take a big, bold action to show them you are committed to them and to make them feel understood, before they make an investment in you. If you want to spend less time figuring out a business idea, focus on something you already know. 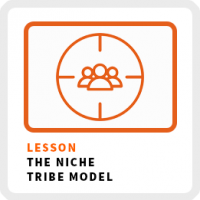 If you want to customers recommending you, so you spend less time chasing them down, focus on a niche tribe that trusts you. So what’s your expertise and for whom?